School is back in session, and I have my hands full. Unless you are a sixth grade English, Language Arts, and Reading teacher in Texas, you wouldn't fully understand. I would explain to you the difference in what I do, as a teacher, that's different because of the grade I teach and the content I teach and,...well,...many other things,...if I had the time. As full as my hands are right now, my heart is overflowing! My students are precious and anxious to learn. We're getting to know each other quickly, and we've already read three chapters in our class novel, and we're working on a project for it. Good things are happening, and we're all excited to be together, learning together. Life is BUSY, but life is GOOD! I've listened to a total of...six,...yes, six,...audiobooks in my life. That's including one I used in my classroom. Needless to say, I do not claim to be an expert. And, as I mentioned in my post yesterday, I'm pretty picky about what I listen to. I have sampled quite a few, but I know after just a couple of minutes if I like what I hear or not. I've listened to Claire Danes read The Handmaid's Tale by Margaret Atwood, which I enjoyed. I'd already read the book, a couple of times, but it was a long time ago. Danes did an excellent job. I didn't choose it because she's famous or an actress. I chose it because I like the sound of her voice, and she paces her reading well. 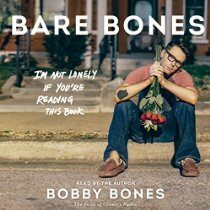 The two books I've listened to most recently are Bare Bones: I'm Not Lonely If You're Reading This Book by Bobby Bones and Seriously...I'm Kidding by Ellen DeGeneres. I really enjoyed hearing the authors read their own works, particularly because they're storytelling about themselves and giving their opinions. I didn't know anything about Bobby Bones, but I learned he's a very popular radio DJ in Nashville. He's syndicated. After I read the book, I found out most people I know seem to know who he is, but I didn't. I enjoyed hearing about his life. He is very entertaining, honest, and inspirational...in an awkward kind of way. If you don't know his story, I would suggest it. The only reviews I saw that didn't seem to like it, as much as I did, were his fans who already knew his story. In other words, the book didn't reveal something to them they didn't already know. Ellen's book was different. It isn't her life story, it's little stories and social commentary and...silliness. When I first looked it up, I saw it was only a little over three hours of listening time. That seemed a bit short for me, and too short to spent $14.99 on it. However, I had a credit with Audible, so I decided to get it. I've always liked Ellen, but I had no idea we agree on so many things about how the world should work. She's a bit of an old-fashioned kind of lady, and I appreciate that about her. While the book is light-hearted, she does encourage the listener to do good in the world and have a social conscience about what we're doing, as humans, to the world around us. I liked her before, I like her even more now. Well, there you have it. My limited knowledge on audiobooks. I'm hoping to use my new found interest in audiobooks to read more books during the school year. I don't have any trouble fitting in the books I want during the summer breaks, but I always get less pleasure reading done once work cranks back up. I've never been one who listens to books on audio. It just...wasn't my thing. I'm not going to say it is now, in a broad sense, but I've certainly learned to appreciate what audiobooks have to offer. I first gave audiobooks a chance when I used one for my classroom. I wanted my students, who were struggling readers, to hear a book that had thirteen different voices. It was a way of showing them how to hear 'voices in their heads' and differentiate between characters when they read. Needless to say, they loved it, as did I. I did not, however, see the need for me to listen to audiobooks, personally, as I love to read in my own head. Then, a few years later (yes, seriously), I decided to take a long road trip alone. I went to Half Price Books and found an interesting book on CDs. I thought I'd try it. I really enjoyed it! The book kept me company, I laughed and cried along with the characters, and - as often happens with books - the theme suited something I needed to think over. It was good for the brain and good for the soul. And good for the miles! I drove eighteen hours and enjoyed every minute! 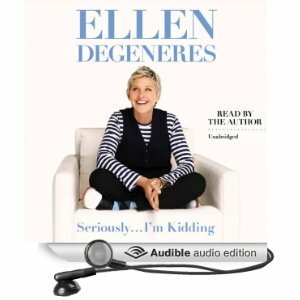 Did that hook me into audiobooks? No, not really, though I'd learned to appreciate them a little more. I was cleaning out and reorganizing my home library. I had a small basket with some books in it. When I dug through them, I found a book on CDs that I had bought long ago (after my inspirational road trip), but had never listened to and forgot I had them. I decided that I needed to either get rid of them or listen to them. I opted to see if it worked for me to listen while I just did my daily driving and trips to see my daughters (one lives an hour away, one lives three hours away). Once again, I loved the experience and enjoyed the narrator so much that I looked up to see what other books she narrates. It was about this time that a teacher friend of mine showed me how her Kindle has her books on it, but that she can switch to audio when she wants. "Whaaaat?! How did I NOT know this?" (Possibly because my head is usually buried in a book? ;) I got excited about all the possibilities! I could read a book at home and, when I have to run somewhere in the car, take the voice with me to continue the story! Now, I'm officially a member of Audible. That's right. I'm finding ways to get through my TBR list much faster, which makes me happy. I'm not rushing through the books (I'd never do that), I've just found more ways to enjoy them and allow them to filter into other places during my days and evenings. I am picky, though. I have to like the narrator. I also still prefer to read for myself when I can sit with a book (or Kindle) in my hand. It also depends on my mood because I love to listen to music, too. I'm still pretty darn happy, though, to find more ways to get my reading time in - especially now that school is about to start up, and I have less pleasure reading time than I do in the summer. By the way, I'm sorry I haven't posted in awhile. Summer has flown by! I'll try to write on a more regular basis now that my yearly academic routine is about to kick in. I do have some books to tell you about, as well as a couple of audiobooks you might find interesting. I will post again tomorrow to tell you about those. I have to go for now. My classroom is begging me to keep working and setting up for the new school year!